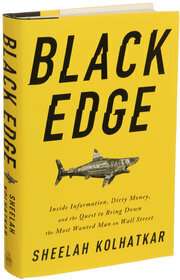 I just finished reading Black Edge, by Sheelah Kolhatkar and I give it a 4/5 star rating. The book focuses on the hedge fund industry and insider trading, specifically at SAC Capital. SAC Capital started in the early 1990s by Steve Cohen and has enjoyed ~30% annual returns for more than a decade. Black Edge outlines some of the methods by which these massive returns were generated. What exactly is Black Edge? White Edge refers to information that gives some advantage but is already publicly available. Gray Edge refers to information that is not widely known and could influence a stock price once widely known. Black Edge, however, is information that is clearly illegal to share or to trade while in possession of the information. In this book, traders would try to get Black Edge like detailed quarterly earnings and drug test results. On Wall Street, traders are always seeking some type of edge. A great example of this can be read in this article from the Wall Street Journal a couple of years ago. Did you know you can subscribe to a service that will fly a helicopter over oil storage facilities to measure inventory levels with advanced cameras? These subscriptions can cost over $300,000 per year, but can be worth millions to traders. This book also talks about ‘Expert Networks’ used by SAC to get access to company insiders. These networks allow individuals with expertise to tap into a network that will pay them handsomely for consulting. Investment management firms can use these experts to refine their models and assumptions. These conversations are supposed to avoid discussion non-public information. It’s a pretty good arrangement on its face but it opens the door for information to be shared that shouldn’t be. Those who might want to profit from knowing something big before anyone else can use these networks to their advantage. The story is very well researched and written and provides a window into a secretive area of the market. Although I read it for entertainment, I still tried to learn something. My takeaway was yet another reminder that I have no business picking individual stocks and competing with folks like this. I’ll just stick with index funds for the bulk of my investing. Oh dang! This doesn't sound like your typical FIRE read; I like it. It's insane the lengths people will go to so they can get ahead of other people and even the market itself. It's definitely worth a read. I've heard that the Showtime show Billions is loosely based off of the same characters and it's easy to see how this story could be a really good movie.